Approved the waiver of value added tax, specific business tax & stamp duty for transferring assets from property funds into REITs. This should pave the way for conversion from property funds into REITs as major transaction costs have been cleared, as Thai property funds can no longer increase capital unless they convert into REITs. The conversion will help extend the lives of the property funds especially those with leasehold assets. Yields could increase anywhere from 10-60% for each new conversion to a REIT in the market. Comment: Despite the quality of its projects, the stock is rather expensively valued. Comment: That’s rather ambitious by DRT, unless the Thai portion of the business is going to collapse. Comment: And yet what is management doing with their shares? I don’t quite feel very comfortable with their practises. Comment: Again wonderfully positioned to benefit from this NGV bus , BUT post these sales earnings will decline to what they normally are. Comment: Every contractor is loving these mega projects and in reality there isn’t a capacity constraint. WHA began in 2003 with the vision to be a leader in built-to-suit modern warehouses and distribution centres. We saw that Thailand’s logistics cost to GDP was very high at 18% and that there was an opportunity to help the country and the industry to reduce the cost. WHA will look at opportunities across the region, say Somyos (right) and Jareeporn Anantaprayoon. 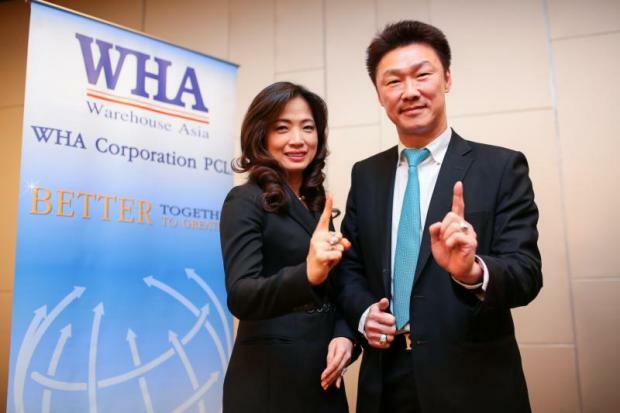 WHA Corporation Plc is the leader in premium built-to-suit warehouse, distribution centre and factory development in Thailand and the region. Somyos Anantaprayoon, president and chief executive, and managing director Jareeporn Anantaprayoon discuss the company’s strategy and outlook. We began with one warehouse and today have nearly 2 million square metres of developed and available land with more than 90% utilisation. We have gained recognition from leading multinationals and large Thai conglomerates for helping to improve their logistics and operations with our total solutions. What is WHA’s business model? Our business model focuses on recurring income from long-term leases and service agreements of our properties. After incubating our assets for a period of time, WHA monetises them by annually selling some mature assets to our WHA Premium Growth Freehold and Leasehold Real Estate Investment Trust (WHART), our SET-listed REIT. This allows us to generate high profits for our shareholders with a limited amount of capital, low risk and still maintain ownership. The other business model we utilise is sale and long-term leaseback, which helps our clients to minimise initial investment costs, minimises tax payments and increases asset utilisation. Comment: The main reasons to have any shares in AMATA at this point are because of its REIT and Amata Vietnam listing. Comment: Demco’s earnings are solid for the next few years without any issue, but the key upside is the if/when WEH can be listed.